Texas has an array of drug and alcohol rehab centers, and many of the facilities have different areas of specialization. Finding the right fit for you or your loved one is an essential step toward a new life in recovery. The state of Texas is famous for music festivals, river culture, and its Tex-Mex spin on Mexican food. Football and farming also have tall reputations in the Lone Star State. Unfortunately, Texas faces a large addiction problem as well. To combat the substance abuse crisis, Texas is home to many types of treatment centers. 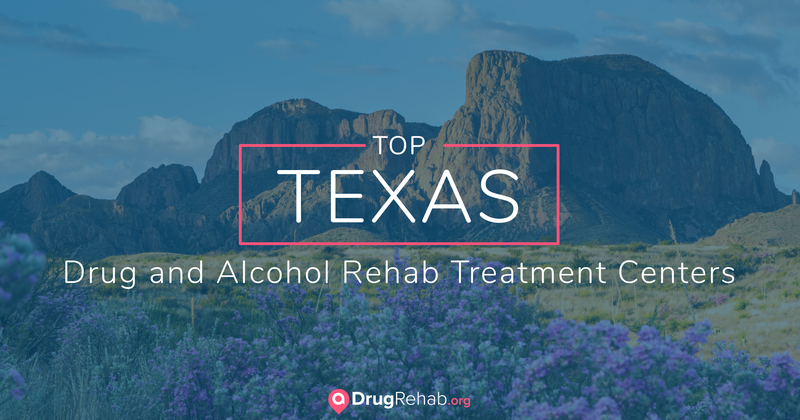 We have compiled a list of the top Texas drug and alcohol rehab centers based on the positive outcomes experienced by patients and the accreditations these centers hold. The Treehouse is a drug and alcohol rehab treatment center that sits on 40 acres of serene landscape near Dallas, Texas. Their treatment program is based on research-proven treatment and clinically sound therapies that are aimed at guiding individuals back to health and a drug-free, meaningful life. This treatment facility provides highly individualized care to every patient and their staff ratio is nearly one-to-one, ensuring each individual receives the level of care needed to fully recover from addiction. They offer a variety of services to accompany treatment, including dialectical behavioral therapy, motivational interviewing, equine therapy, and more. Promises Austin is a premier holistic drug treatment center that offers detox, inpatient, and outpatient treatment. Located on a serene, seven-acre retreat in the Texas hills, Promises offers therapy, yoga, medical and psychiatric treatment, and spiritual care. Promises recognizes that trauma and mental health disorders can fuel addiction and houses mental health treatment for men, women, and professionals. Origins Recovery Center provides drug and alcohol treatment in a tranquil environment in Coastal Texas. This rehab center offers beachside meditations, trauma-informed therapy, and psychological treatment. Origins Recovery has separate, bayside living accommodations for men and women and offers an additional program for older adults looking to begin recovery. Caron Foundation Texas offers evidence-based treatment for addiction, trauma, and co-occurring mental health disorders. This facility offers 12-Step and 12-Step alternatives, including SMART Recovery, Celebrate Recovery, and an optional Bible study. Equine therapy, meditation, and art therapy, gender-specific groups, and medication-assisted treatment are also available at this rehab center. Treatment at La Hacienda disrupts the isolation of addiction, allowing individuals to engage in the “healing that takes place in the context of relationships.” What makes La Hacienda Treatment Center different is its focus on relationships, which is accomplished through a continuum of care that includes medical and detox services, inpatient, and outpatient services. La Hacienda also has specialized programs for those in the professional or collegiate worlds. At Greenhouse Treatment Center, clients can access the full range of care options, including medical detox, inpatient residential treatment, outpatient, and partial hospitalization services. Therapeutic approaches include cognitive behavioral therapy, expressive arts, and wellness, as well as individual, group, and family therapy sessions. Greenhouse also offers a brand promise: if patients who successfully complete 90 days of treatment are unable to stay sober, they can return to Greenhouse for a complimentary 30 days. This inpatient treatment facility offers robust therapeutic activities, which allow the body and mind to adjust to life without drugs and alcohol. Quality clinical care is balanced with recreation activities including equine therapy, a professional gym, an Olympic-size swimming pool, and a ropes challenge course. Summer Sky includes medical detox, holistic care, and relapse prevention planning. When an individual uses drugs or alcohol for an extended time, the body becomes dependent on that substance, making the detoxification process the initial step toward recovery. During detox, the body rids itself of the drug, which can lead to uncomfortable and dangerous withdrawal symptoms. Detox should happen in a medically supervised setting for drugs like alcohol, benzodiazepines, and barbiturates, as withdrawal can be unsafe. Keep in mind that the discomfort of withdrawal is temporary. Once your system has detoxed, you will be in a much clearer state to begin recovery. When looking for the best type of treatment, studies show that long-term care increases the chance of positives outcomes. Prolonged treatment is defined as treatment that lasts at least three months. Seeking a residential or Texas inpatient drug rehab center can be a great option for long-term care, as inpatient treatment has the highest completion rates in the industry. Inpatient residential treatment also allows the client to begin recovering in a protected environment, separated from situations that could be risky for their sobriety. Detoxing from drugs can look different for each person, depending on what is currently in an individual’s system. Drugs such as alcohol, benzodiazepines, and barbiturates should be detoxed under medical supervision, as these can come with life-threatening withdrawal symptoms. Opioid withdrawal, though not usually dangerous, can be extremely uncomfortable. Many individuals say they relapsed and used again simply to alleviate the pain of opioid withdrawal. Texas drug and alcohol treatment centers that utilize medication-assisted treatment (MAT) can be of service here, as they prescribe medications that minimize withdrawal symptoms. Most rehab facilities that participate in MAT use Suboxone (buprenorphine) or methadone to treat individuals suffering from opioid withdrawal. Buprenorphine-based medications like Suboxone are less likely to be abused than methadone. The Treehouse, located in the serene woods of Scurry, uses a medication-assisted treatment that allows clients to detox in a more comfortable manner. MAT reduces drug cravings, so clients are able to continue MAT after detox to progress through their recovery. The Treehouse provides multiple recovery tracks that include individual, group and experiential therapies, as well as holistic components such as Tai Chi, yoga and massage. In order to achieve the best outcomes from drug or alcohol treatment, The National Institute on Drug Abuse recommends at least 90 days of treatment. For those who attend prolonged treatment, a Texas inpatient rehab facility can be an excellent choice. Inpatient programs can be short- or long-term, based on the addiction type and any co-occurring disorders present. A short-term treatment in Texas could be up to 28 days, which can seem a good fit for those with jobs or family responsibilities. However, research indicates this is not the ideal length of stay. Seeking long-term treatment in Texas considered ideal, and can last three months to a year. Long-term treatment has the highest completion rates of any treatment type in the U.S.
Arbor Behavioral Healthcare offers a “highly personalized plan of care in a luxurious residential setting.” The Arbor is located outside of Georgetown, on a 67-acre ranch along the San Gabriel River. The Arbor provides cutting-edge therapies, including an innovative equine-assisted psychotherapy program. When someone receives a dual diagnosis, it means their substance use coincides with another health disorder, called co-occurring disorders. Co-occurring disorders can be challenging to treat, as the two disorders often fuel one another. For individuals with co-occurring disorders, such as substance use disorder and anxiety, finding a treatment facility that focuses on treating co-occurring disorders can be helpful. Facilities like Touchstone Ranch Recovery Center in Hico specialize in the treatment of co-occurring disorders. Over half of all individuals with a drug addiction also suffer from a co-occurring mental health issue, and Touchstone Ranch helps these people find relief and healing from addiction. Since drug and alcohol treatment can be an overwhelming experience, many individuals feel more comfortable in a gender-specific treatment facility, or one that focuses on serving the LGBT+ community. By ensuring the environment feels safe and respected, clients are able to better focus on this initial portion of their recovery journey. Starlite Recovery Center in Center Point has a program tailored to address the LGBT+ population, and their concerns with addiction. Community peer support is offered, as well as individual and group counseling. upscale amenities like fine dining, deluxe fitness centers and saunas, and exclusive accommodations. Although luxury rehab centers will usually have a higher cost range, clients receive an unparalleled quality of care. Those who attend a Texas luxury rehab center will be given a customized approach to treatment, and access to top professionals in the industry. Great Oaks Recovery Center helps individuals recover in a serene location just south of Houston. Great Oaks provides educational group sessions, health and wellness groups, and therapeutic recreation activities. In addition, clients can benefit from homeopathic therapy, massage, hypnosis, acupressure, and Biofeedback therapies. Those who have struggled with addiction know that sometimes legal troubles occur as a result of choices made during addiction. Austin Drug & Alcohol Abuse Program (ADAAP)participates in the DWI & Drug Offender Education Program through the court system, offering classes for those who are court-mandated to receive treatment. This facility offers state-certified programs that provide affordable alternatives to those facing legal trouble. Another treatment alternative is intensive outpatient programs (IOP). Within these programs, individuals return home at night, which can create a less secure environment for treatment. This may also be a reason behind IOPs higher dropout rates. Outpatient centers in Texas are often considered an excellent “step down” service for clients, after they’ve completed an inpatient program. Both IOPs and partial hospitalization programs (PHPs) can serve as healthy alternatives for those who are unable to attend inpatient due to professional or personal reasons. Additionally, community services and support groups are considered outpatient treatment, and many find these to be an essential part of building a recovery support network. Lubbock Addiction Services promotes building “a sturdy foundation of recovery from alcohol, drugs and other related behaviors by providing an environment that fosters safety, trust, and community at an affordable price.” While in Lubbock’s intensive outpatient program, clients will engage in educational therapies that help to identify triggers, improve decision-making, and discover how to have fun without drugs or alcohol. It’s a commonly held belief that drug treatment is expensive and out of financial reach for most people. This is untrue, as there are financial assistance options available to those seeking help. Some facilities may require an out-of-pocket cost, but many Texas drug and alcohol rehab centers accept public and private insurance coverage to help minimize this expense. Certain Texas drug rehabs accept public insurance, such as Medicaid. Most people are also partially covered by government- or state-funded insurance vouchers. Some Texas treatment centers offer sliding scale fees, payment plans, and scholarships to help offset the cost of drug treatment. For those who are unable to pay for inpatient drug and alcohol rehab or who do not have sufficient insurance coverage, there are Texas drug rehab facilities that offer free, low-cost, or state-funded drug and alcohol addiction treatment. While these programs often come with fewer amenities and options for treatment, they still provide the support needed to recover from a substance use disorder and get on the path to a drug-free life. Salvation Army Adult Rehab Center Austin offers a free treatment program for men and women living with a substance use disorder who are unable to pay out-of-pocket for treatment. They require patients to stay at least six months, as this is the length of time they feel is required to break old habits and replace them with new, healthy ones. This program provides the spiritual, emotional, and physical support needed to help men and women recover from addiction and live a productive and meaningful life. Texas’ unique offering of treatment facilities is a response to the devastating addiction rates that continue to befall the Lone Star State. More than eight percent of youth use illegal drugs. Over 100,000 teens use painkillers not prescribed to them. More than 12 percent of youth binge drink. Nearly 1.4 million Texans are dependent on or abuse alcohol. Almost half a million Texans are dependent on or abuse illegal drugs. Sadly, only 6.4 percent of the people dealing with alcohol addiction and 8.6 percent of those struggling with drugs seek treatment per year. Finding the right Texas drug and alcohol treatment center and understanding payment options can feel overwhelming. For more information about Texas inpatient drug and alcohol rehab centers, contact us today. *The facilities mentioned in this article are not affiliated with aDrugRehab.org.